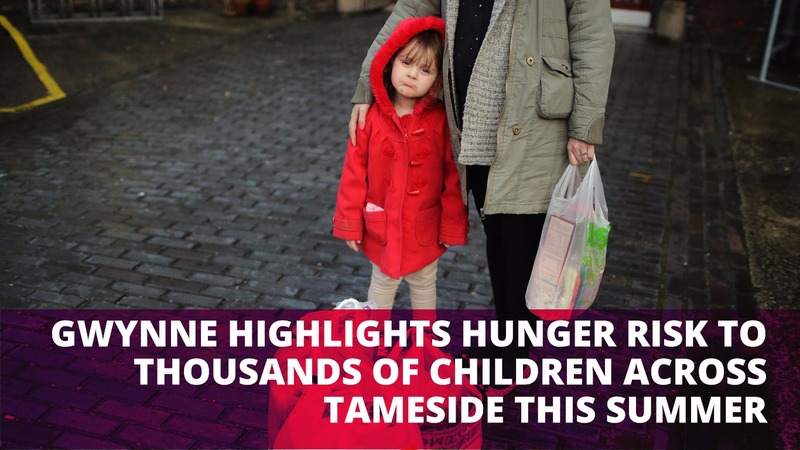 Denton and Reddish MP, Andrew Gwynne, has raised his fears for children across Tameside as thousands could go hungry this summer as schools remain closed. New Trussell Trust data reveals that families are now increasingly reliant on food banks during the summer holidays, with 47% of food parcels going to families with primary school aged children. The worst affected will be the estimated 6,401 children across Tameside who will no longer receive the free school meal they are eligible for during term time. Even though more households than ever before have at least one member in paid work the unfortunate fact is that more and more families are having to turn to foodbanks to help make ends meet. The most recent figures from the Office of National Statistics have supported this as they revealed that real household disposable income per head has dropped 2% from compared to 2016. As a result the children of these families risk hunger over the school holidays as their parents often don’t have the additional resources to feed their children, whereas normally they would receive a nutritious lunch at school. There are a total of 176,140 children at risk of going hungry this summer across the North West with thousands not having access to a school meal at lunchtime and their families not always able to make sure the children are fed. Real wages are falling in real terms as inflation rises, which will leave more children at risk of going hungry. “I’m angry that so many hard working families are having to rely on food bank parcels to help feed their children over the school summer holidays. “Child poverty is at its highest level since the crash of 2008 with wages falling; as a result, working families are worse off. This isn’t an aspersion, but facts being reported by the respected ONS.